A goal by Tarik Elyounoussi and the expulsion of Besiktas’ striker Vincent Aboubakar shortly before the second half was not enough for Olympiacos who lost to the Turkish team 4-1 on Thursday in the second leg of the UEFA Europa League stage of 16. 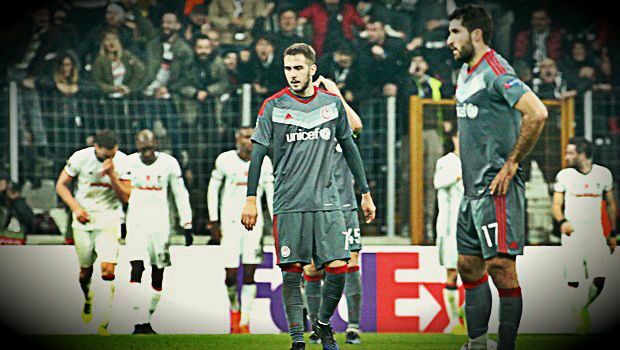 Two goals by Ryan Babel, one by Aboubakar and a fourth one by Cenk Tosun led the Turkish league leaders into the quarter-finals with a 5-2 aggregate victory over Olympiakos, after the 1-1 draw in Piraeus on March 9. The Istanbul club quickly built on their away goal when Aboubakar — Besiktas’ scorer in Piraeus — netted again to put the hosts ahead in the 10th minute. Twelve minutes later, a goal by Babel gave a clear lead to the Turkish side. The two goals and Besiktas’ ease to reach the Olympiacos box seemed to dash the Greek team’s hopes. However, Elyounoussi pulled a goal back and Olympiacos built some confidence. The Greek side was further encouraged when just before half-time Aboubakar was sent off after a header to Panagiotis Retsos. Yet Olympiacos could not capitalize on their numerical advantage in the second half. The visitors had possession of the ball but failed to threaten the Turkish defense. Babel struck again in a counter-attack in the 75th minute and Tosun, who came from the bench, completed the scoring with six minutes remaining.